Whether you are editing a telephone conversation or reinventing the intro to the Brady Bunch, ProSlice: Volume 1 by Pixel Film Studios has the split screen settings for you. This collection of Final Cut Pro X plugins features 50 screen slice templates. With on-screen controls and 3D camera perspectives, ProSlice: Volume 1 provides a powerful and easy solution to split screen editing. Cut out shapes and objects using the ProMask Professional Final Cut Pro X 20 point tool. Maybe you want to create a selective focus effect or black and white effect on an object to stand out. Well, this is the best way to do just that. And guess what?! It’s free with ProSlice: Volume 1! With 50 slice presets to choose from in Final Cut Pro X, you can slice from right-to-left, top-to-bottom, and every which way in between. Split your screen into two, three, four or even five sections. 3D capabilities are also available in this fine plugin. On-Screen controls, with a reference guide, allow you to visualize the perspective in a brand new way. Keyframe the perspective of your clip and get the illusion you are walking past your scenes. Use the intuitive controls in the FCPX effects inspector to change the border width, color and placement of these hand-dandy dividers. Lets say you don’t want your mashpotatos to touch your vegtibles on your plate (Canvas). Then slide them away at the click of a mouse! 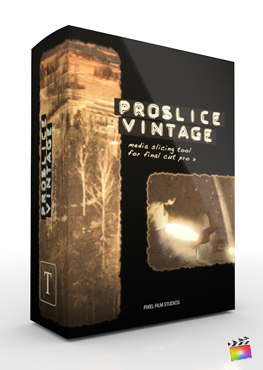 PROSLICE was professionally designed to work seemlessly with Final Cut Pro X. Use the on-screen controls in the viewer to move, rotate, and scale your clips inside their designated areas. It doesn’t get any quicker or easier than that! Where do I find ProSlice: Volume 1? Once the installation is complete, you can find ProSlice: Volume 1 in the FCPX Generator library.